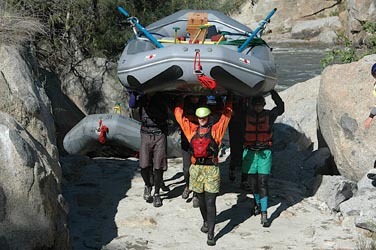 There are many outdoor activities to take part in when visiting the Kern River Valley in addition to your whitewater rafting or kayaking trip. If you’re a hiker, the great thing about a trip on the Forks of the Kern is that a short hike is automatically guaranteed with each trip…just to get to put-in. Either that or you can opt to ride a horse. If you are looking for more outdoor activities after your time on the water though, hiking, mountain biking, camping and possibly even skiing and snowboarding are some options along with great fishing at Lake Isabella. There is a great trail that goes right along the last few miles of the Forks of the Kern beginning at Johsondale Bridge and heading upstream along the river left bank.